Eighty years ago, just after Thanksgiving, children across America turned on their radios and heard a couple of voices very much like their own: those of Judy and Jimmy Barton, a sister and brother eagerly composing their wish lists to send off to Santa Claus. Judy asks for a velocipede, seemingly a hot item in 1937 but not even a recognizable word to most of the children who've listened to the broadcast in holiday seasons since. 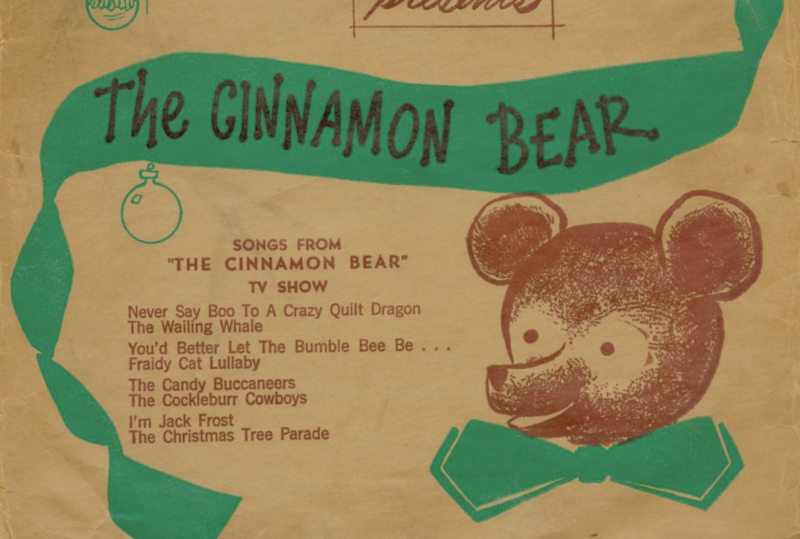 Despite the occasional such archaism, The Cinnamon Bear, the series in which Judy and Jimmy star, continues to enchant not just generation after generation of kids, but also those grown-ups among us who savor the opportunities this time of year affords to more fully appreciate timeless childhood pleasures. The Cinnamon Bear follows the adventures of Judy and Jimmy as they search for the lost silver star that tops their Christmas tree. They first check the attic, there encountering the title animal: Paddy O'Cinnamon, an Irish-accented teddy bear with a tendency to greatly overestimate his own fearsomeness but an indefatigable spirit of service as well. He even helps the Barton children "de-grow" to miniature size in order to take the hunt to his home of Maybeland, a hidden fantasy realm inhabited by such eccentrics, harmless and otherwise, as the Crazy Quilt Dragon, the Roly-Poly Policeman, the Wintergreen Witch, Oliver Ostrich (prepared with a musical number about his love of scrambled alarm clocks and bacon), a flying hat, and even Santa Claus himself. With Christmas over, the children of 1937 had no choice but to wait almost an entire year before they could hear The Cinnamon Bear again. Growing up myself about half a century later, I had the show as a box set of cassette tapes to which I binged-listened on a few different holiday seasons. But now, with seemingly the entire golden age of radio freely available on the internet, kids and anyone else besides can listen however and whenever they like. You'll find all 26 episodes of The Cinnamon Bear on the Internet Archive, as a Youtube playlist, and even as a podcast on iTunes. (You can stream them all above.) This year, on the 80th anniversary of the original broadcast, why not "air" it for you and yours as those first listeners heard it, once an evening except Saturdays, until December 25th? Though each episode may be in doubt as to whether Judy and Jimmy will ever recover the silver star, it's no spoiler to say that, with the assistance of Paddy O'Cinnamon, they d0 find their way to a memorable Christmas indeed.